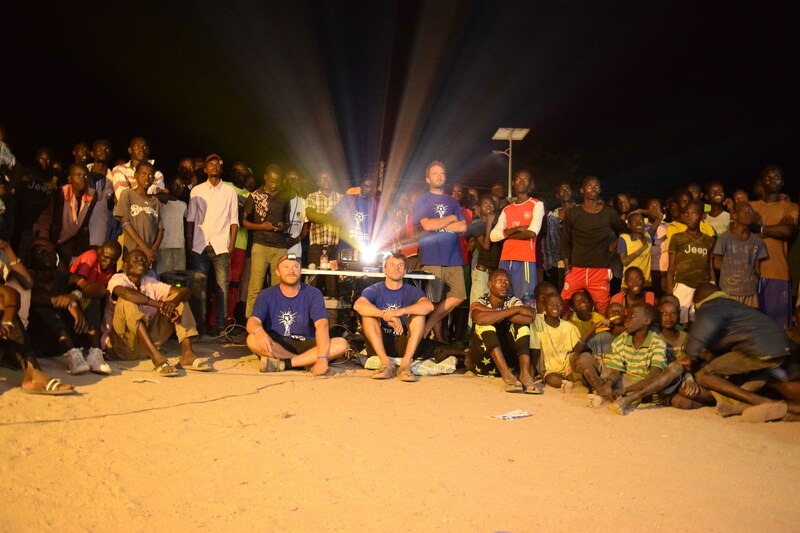 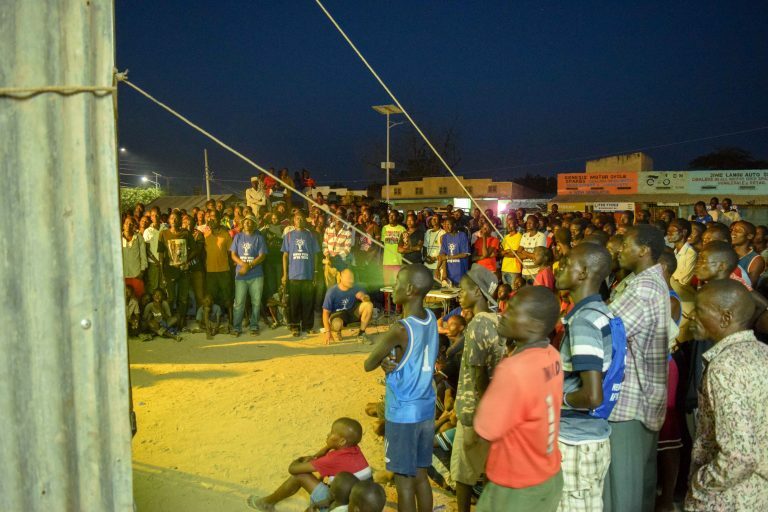 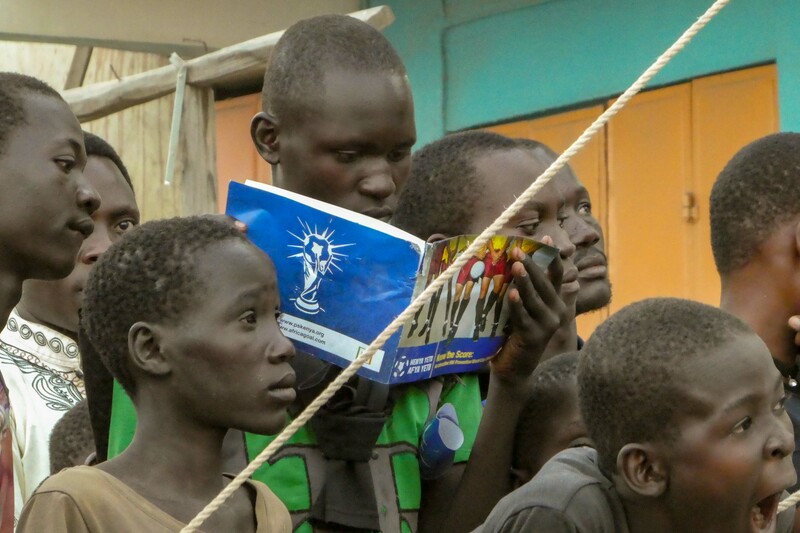 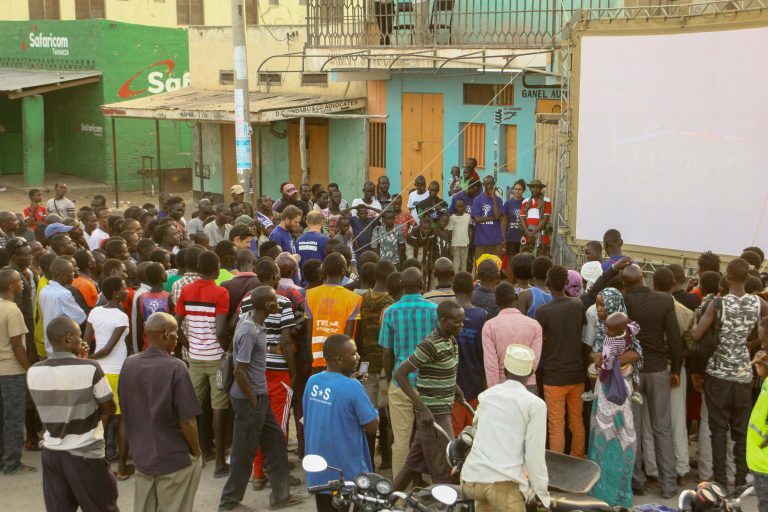 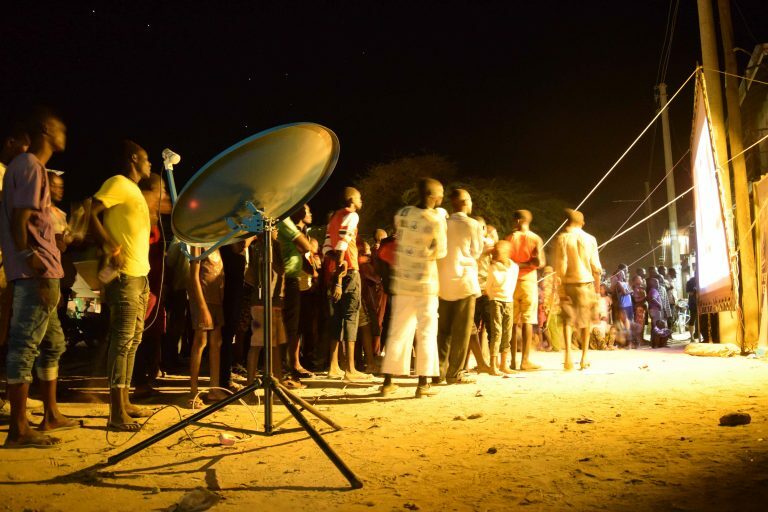 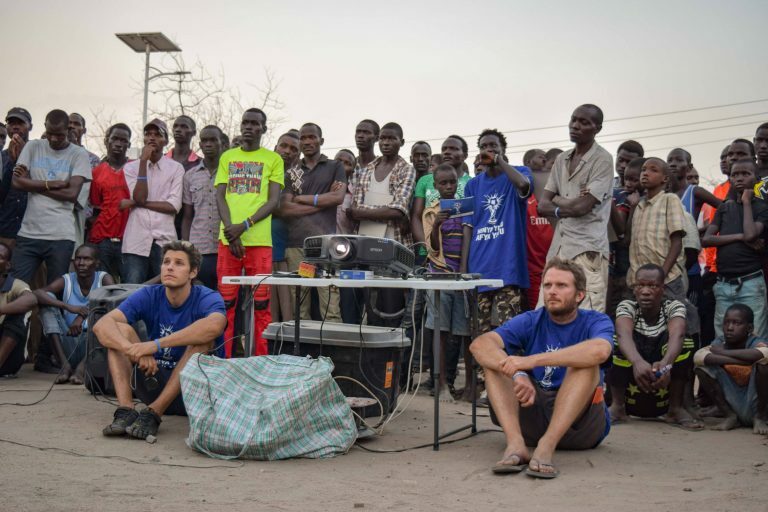 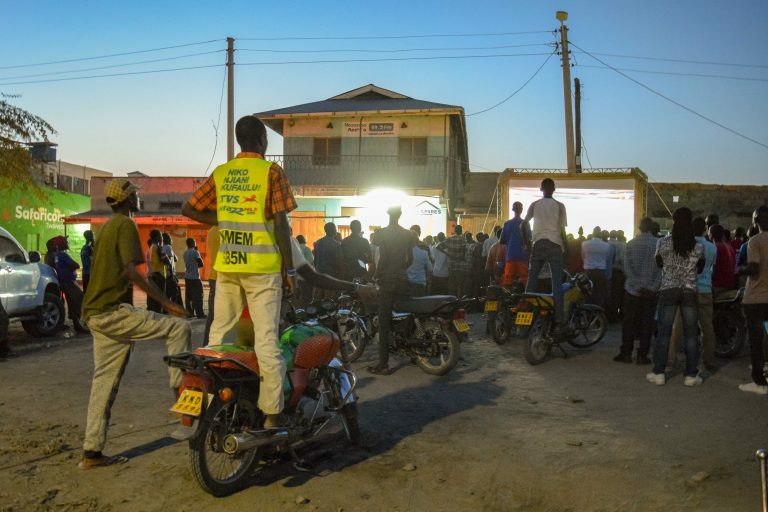 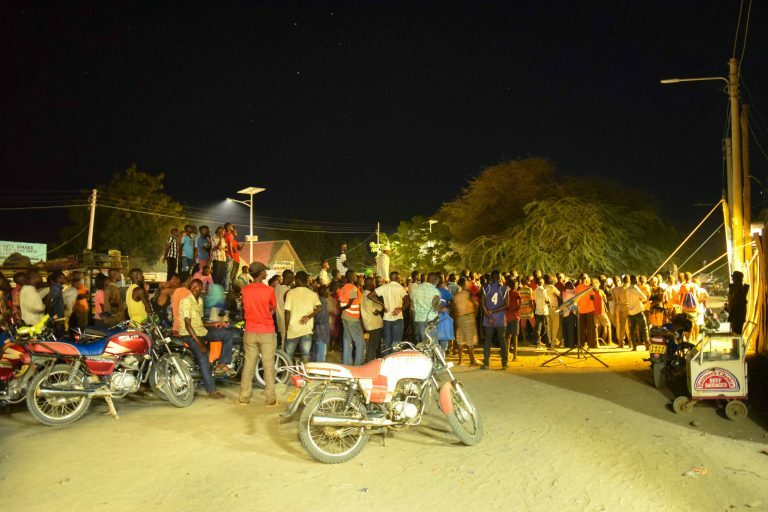 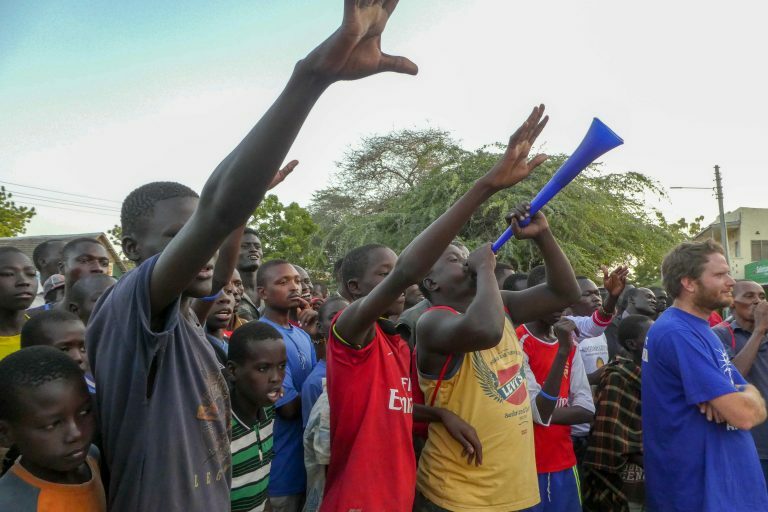 We headed back to Lodwar for the 2018 World Cup – and 2018 Africa Goal – final event. 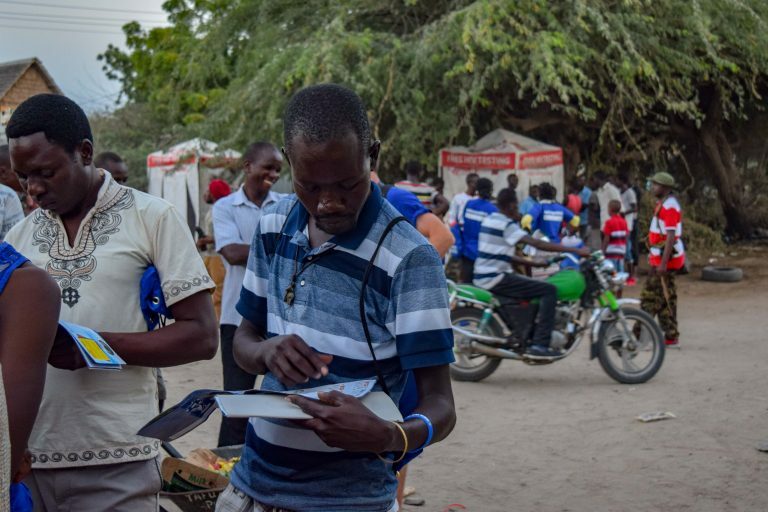 Together with the partners the day before, we had found a fantastic location right in the centre of Lodwar, at the intersection of two roads and with the shade of a building. Our challenge was the timing of the match – with a start time of 6pm, it was still too light for the projection. 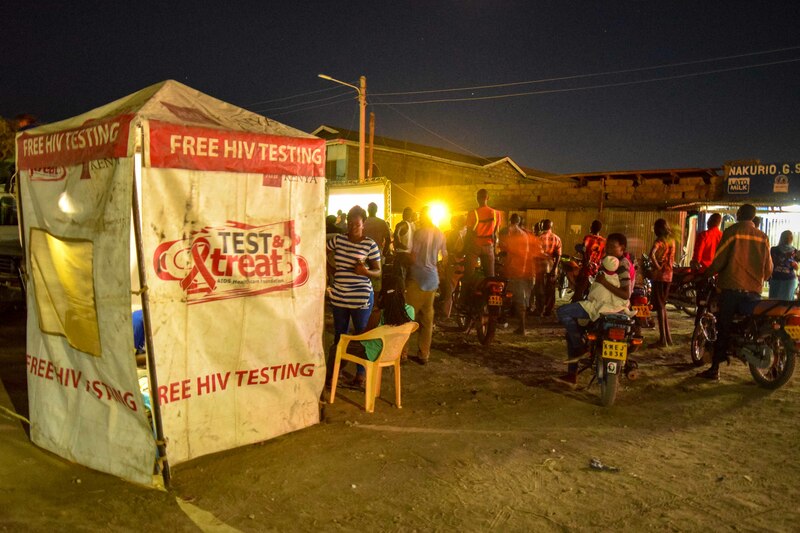 We considered an indoor location but did not want to limit the number of people who could attend the event, so opted for a poorer image for the first half and to use the time for additional HIV information and activities. 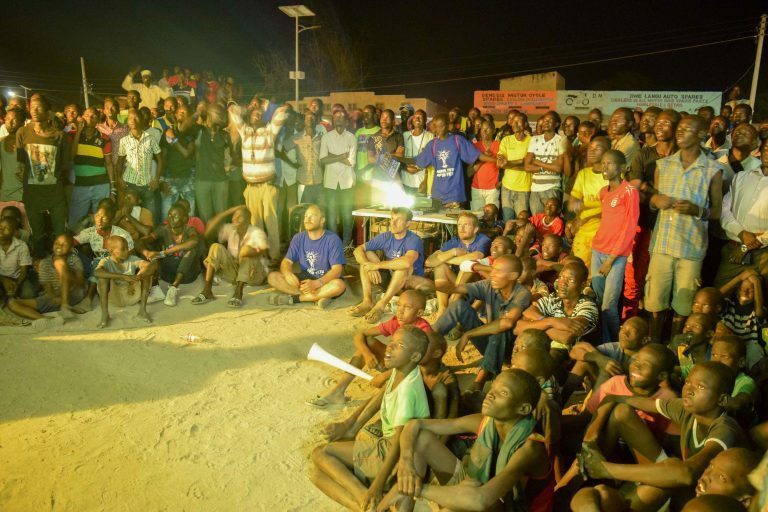 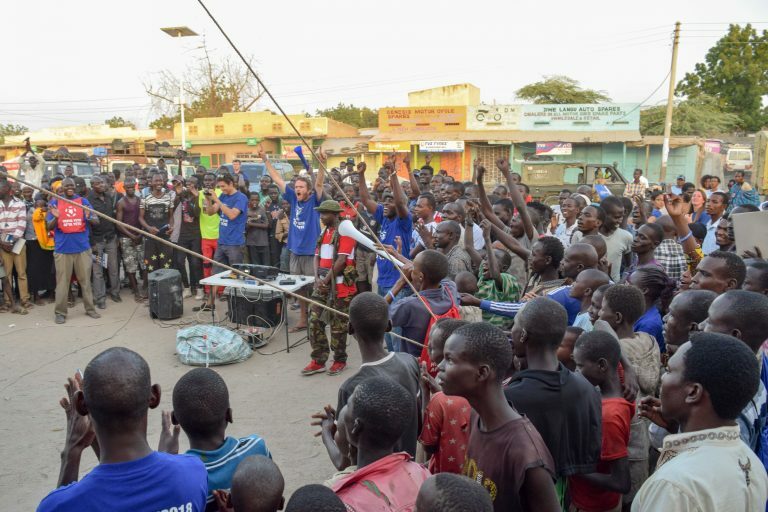 We kicked off with some rap and dance competitions and a couple of vuvuzelas blown frequently to build the energy and crowd. 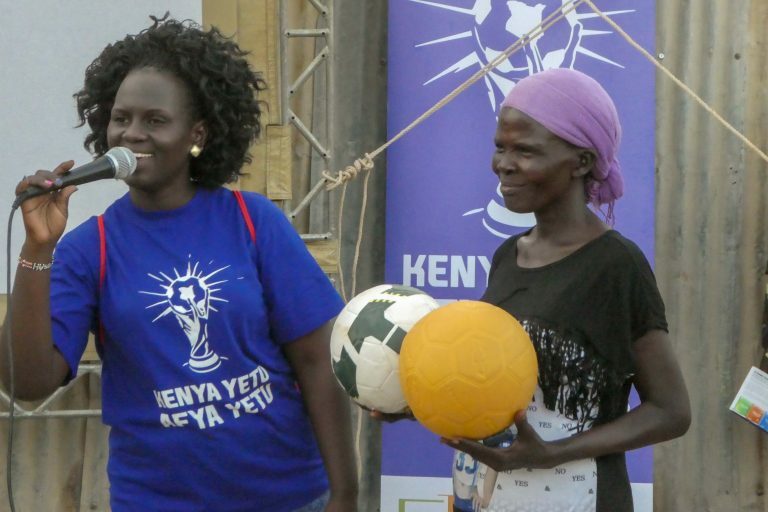 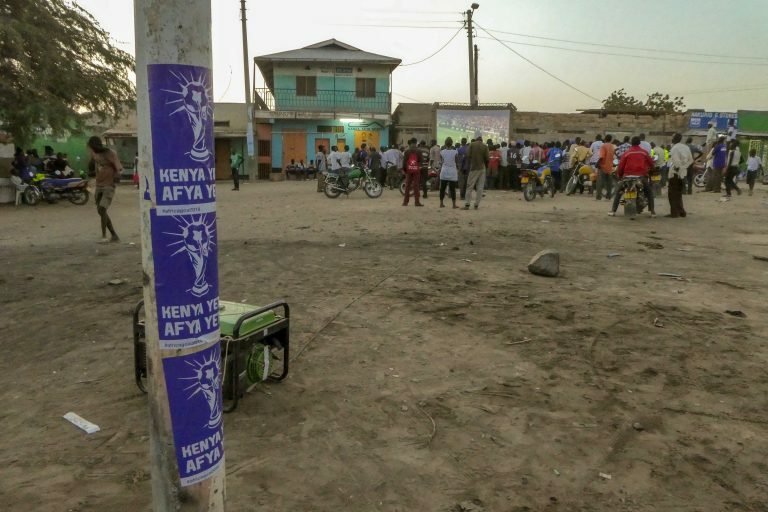 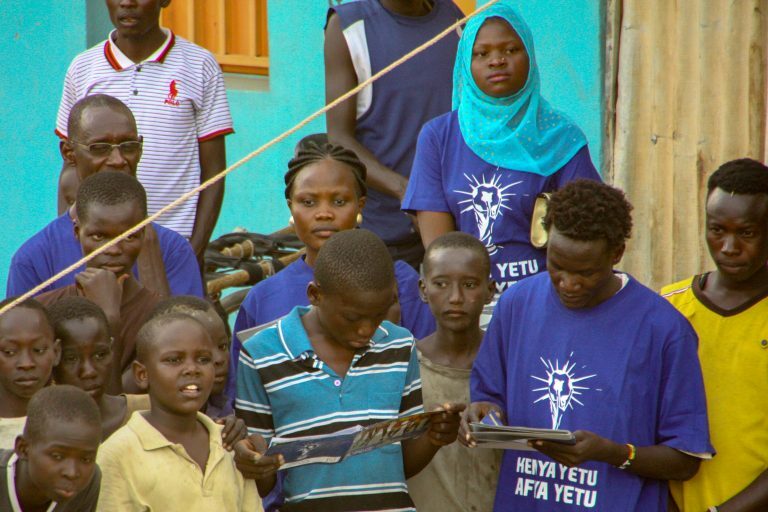 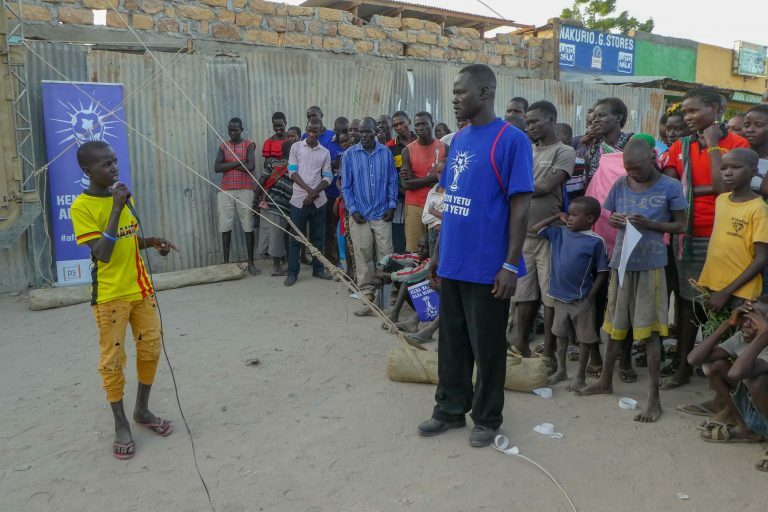 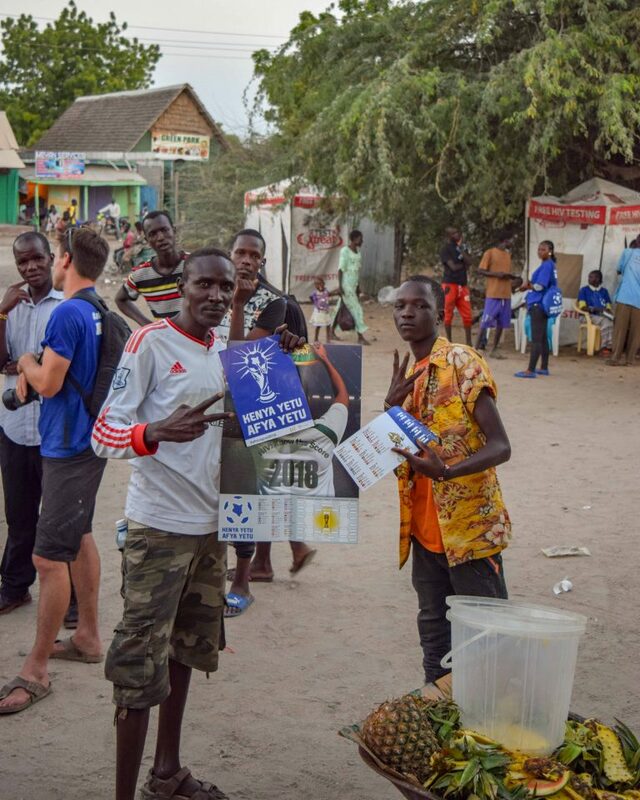 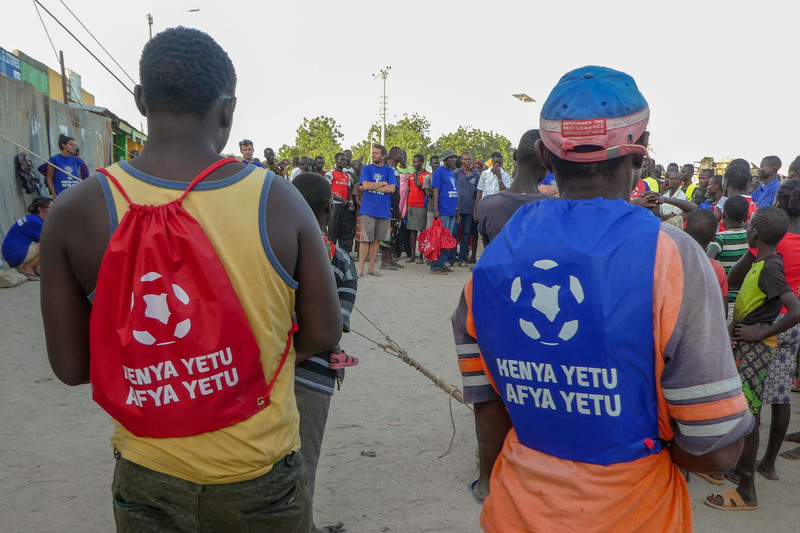 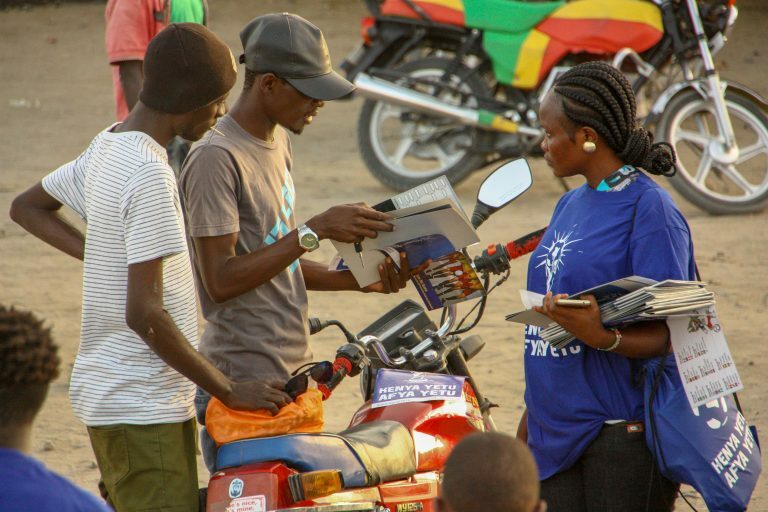 The peer educators maximized the time available running an HIV quiz, with footballs and Africa Goal T-shirts as prizes, and inviting people to speak about their experiences of testing. A couple with their baby also came forward to speak about Prevention of Mother to Child HIV Transmission (PMTCT). 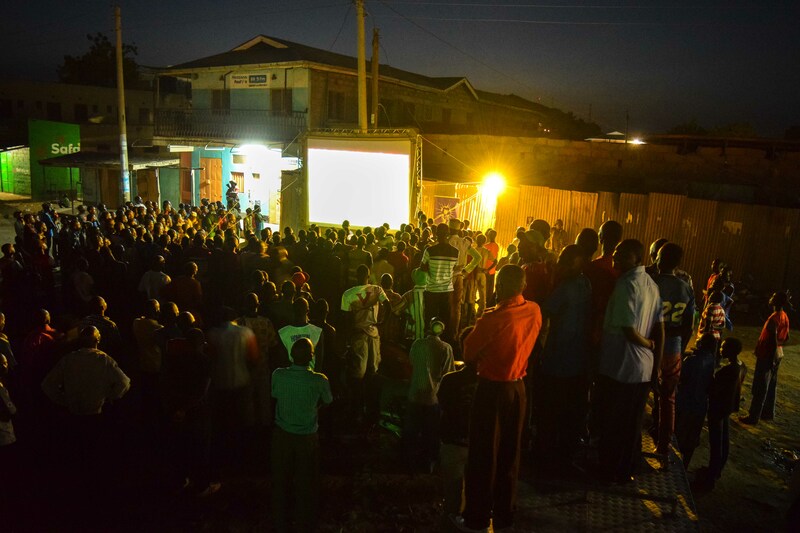 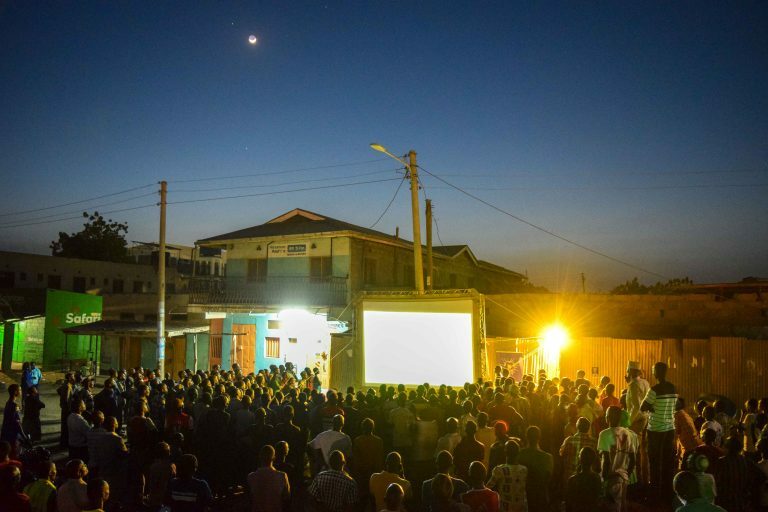 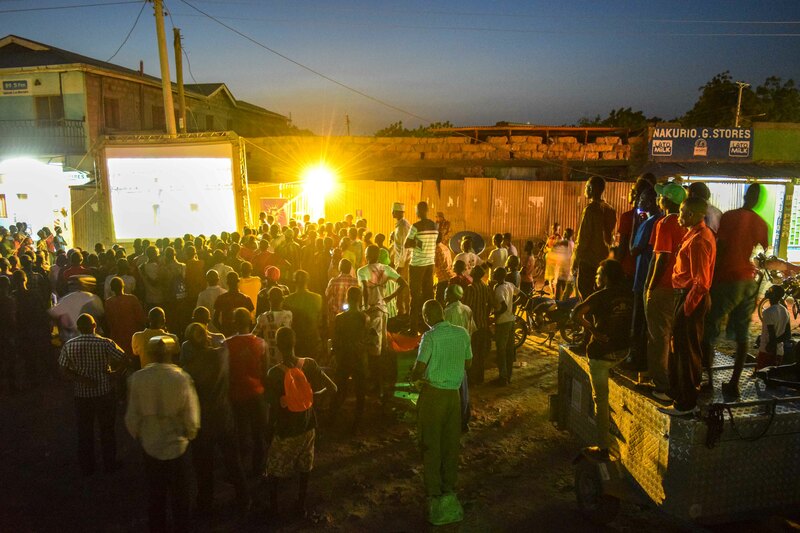 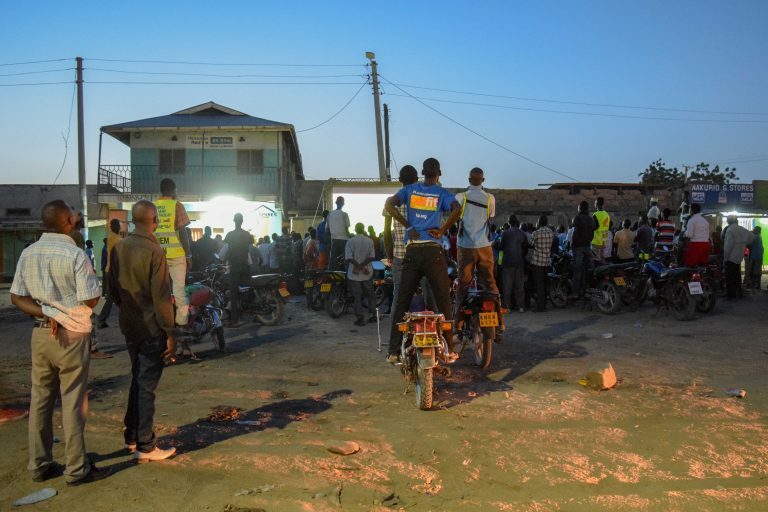 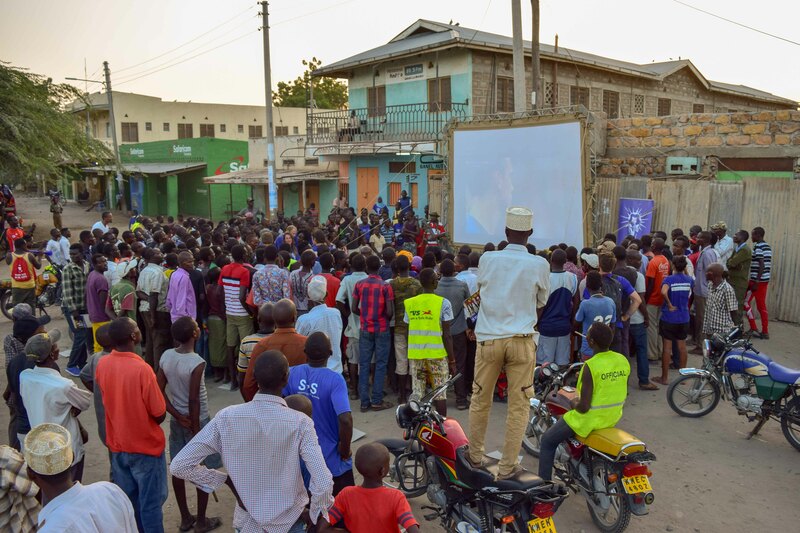 As the sun set towards the end of the first half, the crowd continued to grow for this exceptionally high scoring and exciting World Cup final. 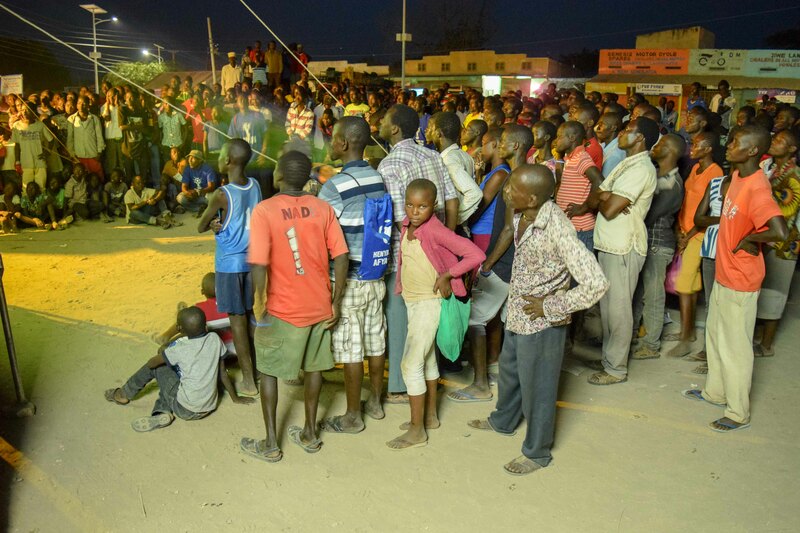 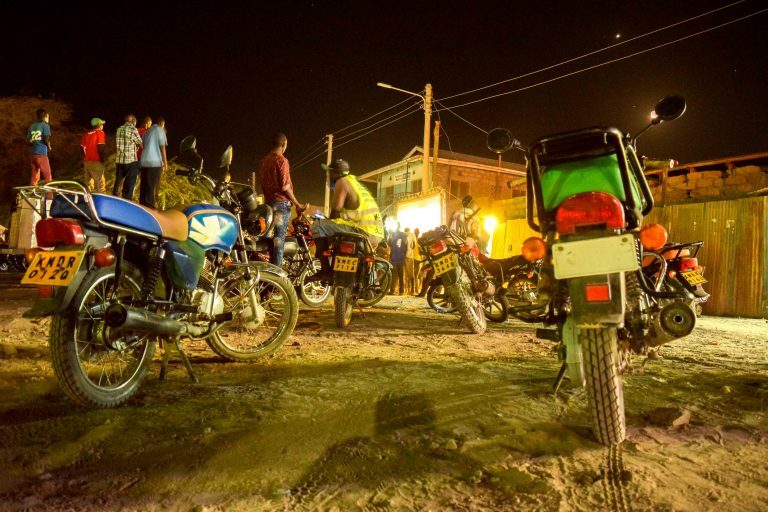 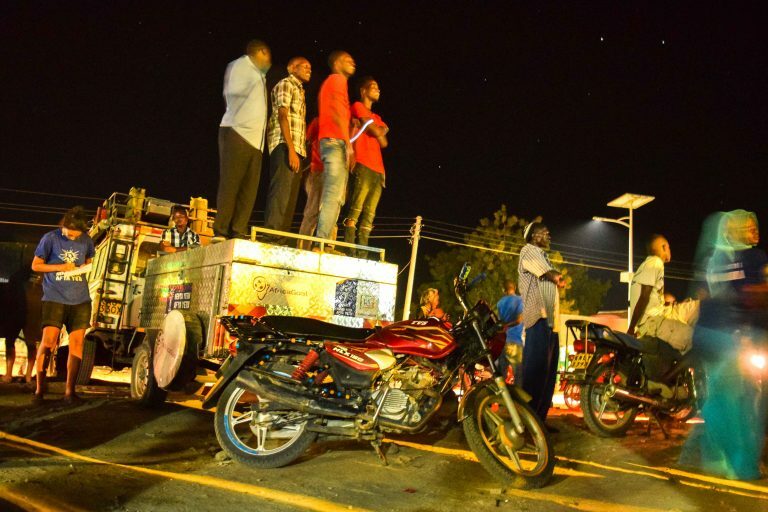 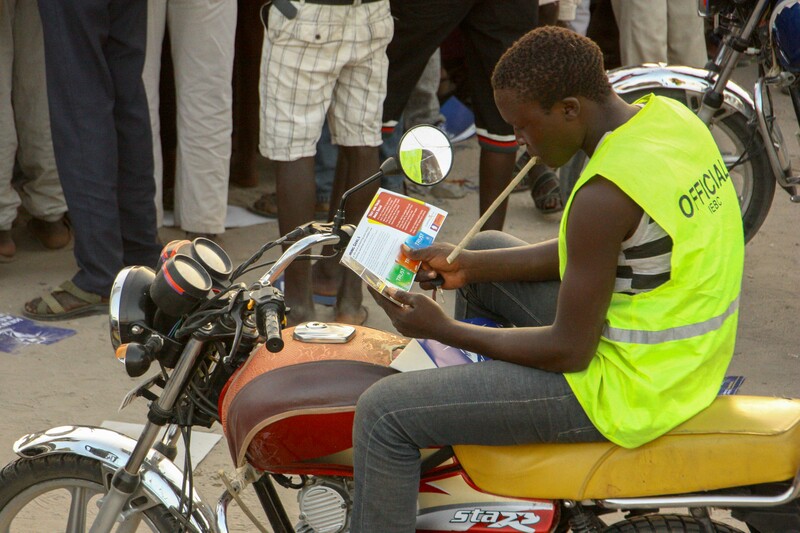 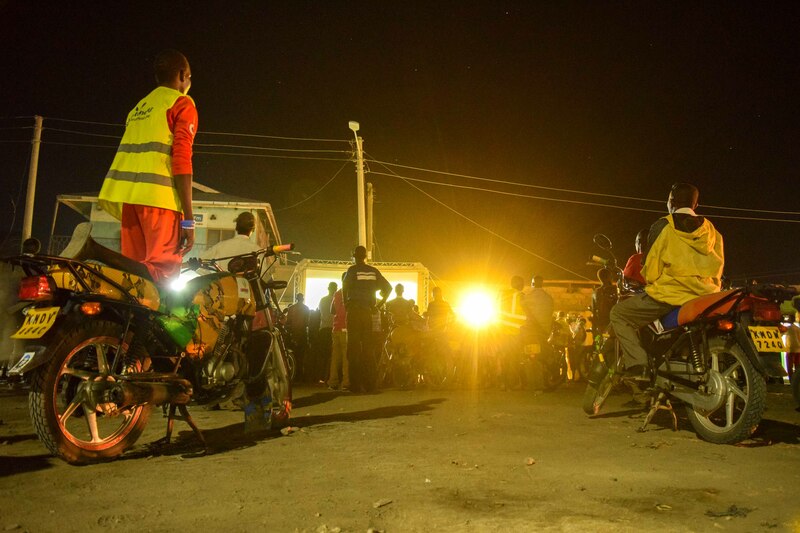 In total around 700 people attended the event and an impressive 121 received HIV testing services, with testing continuing for an extra hour compared to previous events during the closing ceremony. 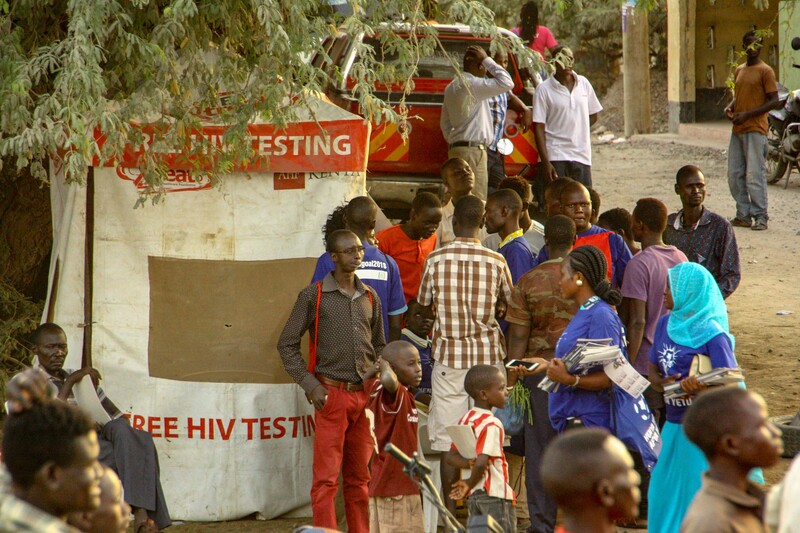 The HIV counselors also used group pre-test counseling as an effective way to provide testing services to the large numbers of people requesting them. 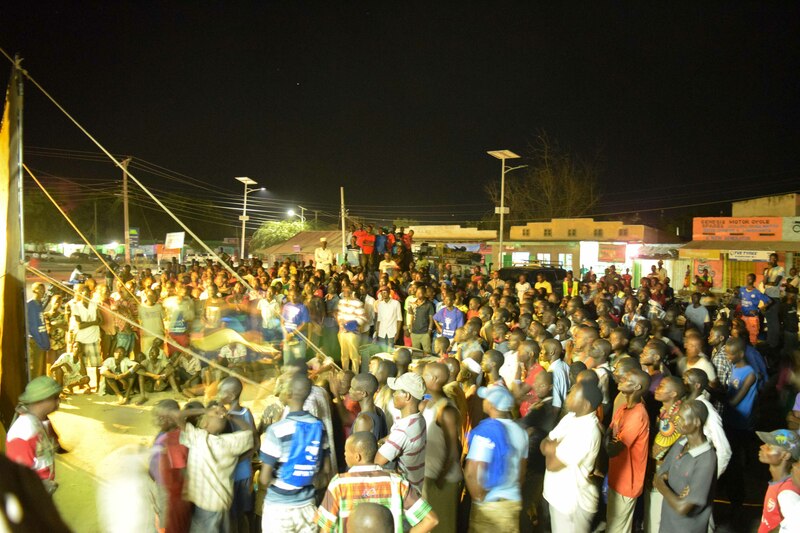 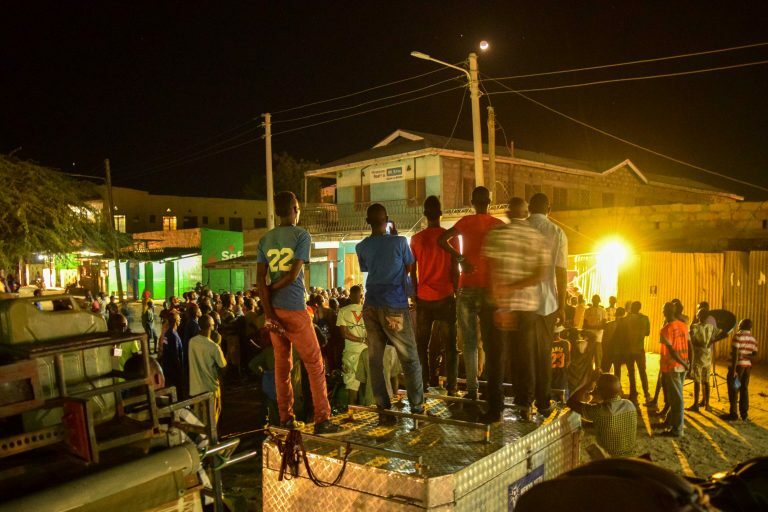 With many of the crowd supporting France because of the large number of players of African origin, and the location in the centre of town, the atmosphere was bordering on rowdy but overall festive, and a very fun – as well as successful – World Cup final was had by all involved. As we packed down our screen for the final time for this year, we were pleased to tip out our four 30-kilo bags of sand, donating it to the construction site behind where we had placed the screen. Eric, one of the audience members who received the on site HIV testing services told us how he had already had a test, but not for some time, so when he saw our event, with the football on and people speaking openly about HIV, he thought it was the moment for another one. As clear validation of the Africa Goal concept, he said ‘You nailed it!’. While looking forward to a couple of days of rest, we are already excited and preparing for Africa Goal 2022.